The pleasure to hear all six finalists in the closing gala concert at the 9th Joseph Joachim International Violin Competition brought home the message that it is music that wins the day. High-points of the evening followed one another in brisk tempo as three additional prizes, the Special Prize (3000 euros for the best interpretation of the compulsory composition, Robert Coleman’s "Cut up"); the Audience Prize (5000 euros) and a Community Prize of 1000 euros. 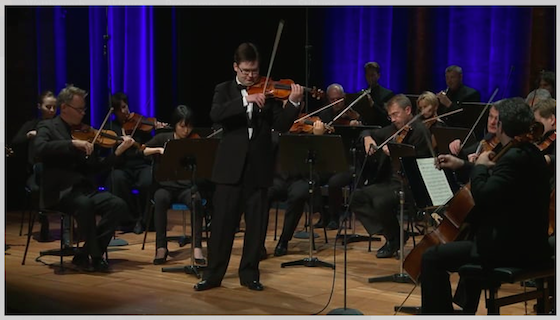 4th prize winner Benjamin Marquise Gilmore treated the audience to color-infused dream harmony and sinuous sound in Prokofiev’s Five Melodies. The poet amongst the finalists deserves a loyal following of supporters in the near future. Bravos continued from Gilmore to 3rd prize winner Richard Lin who exuded warmth, charm and confidence in his contrasting gala gifts wonderfully supported by Melanie M.Y. Chae: Achron’s Hebrew Melody and Joachim’s arrangement of the Brahms Hungarian Dance no. 7. Ayana Tsuji winner of the 5th prize won the hearts of the both the public and a ‘special jury’ composed of music critics including your faithful reporter. One of the jewels in Hannover’s crown, the youngest contestant delighted the composer and fellow jury members with a performance of the compulsory composition that projected super human passion into the weighty score. A competition is but a reflection of a moment, a long moment consisting of a candidate's presentation in a series of rounds in which jury members consider criteria such as: technical mastery, talent for musical projection, career potential and communicative abilities. It would be an understatement to state that it is monumentally difficult to whittle down a considerable field of fine players to a select group of six as the spectrum of subjectivity as to “what is talent?” could fill volumes. And, as the non-voting jury president Krzysztof Wegrzyn shared, “each and every one of the 35 candidates selected to participate are winners in terms of their achievements and artistry.” The juries and public have spoken, let the music play on and on. Ayana Tsuji. Photo by Benjamin Bonouvrier. 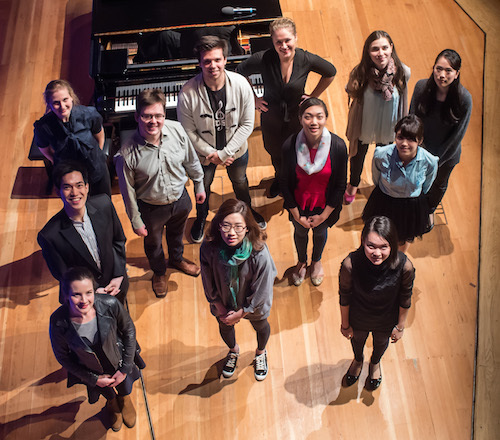 Performances from the Joachim Competition can be viewed on the competition's website: Click here to listen to the latest performances and click here to view archived performances. Shion Minami, a lovely apparition in purple took a muscular approach to Korngold’s Hollywood potpourri. An exemplary performer with the ability to project her ample sound to the very last row in the hall, Minami is indeed all about projection and articulation. Every phrase is punctuated and played with a great sense of urgency: the ebb and flow of the oft-saccharine score was missing in action. Relaxation and contemplation especially at the end of long phrases are not part of the accomplished violinist’s musical vocabulary. An artist performing at such an impeccable level will undoubtedly grow to discover the joys of longer phrases and the wit that lies so close to the surface in the emigrant composer’s nostalgic blend of middle European forms with America’s sassy slapstick. The ‘ain't necessarily so’ blues that extinguish the slow movement were impeccable in terms of control yet clueless in terms of musical antecedents. The closing movement was dashed off with great élan. Just 17, Ayana Tsuji is an artist of consummate taste and persuasive musical power. Her g-string passages burned with inner fire, octaves were freed from the box of pure technical exercise and each and every phrase was treated to a special ending in order to make room for the subsequent musical idea. Tsuji’s second movement could open the gates of a rainbow-infused heaven while the atavism that inspired her third movement brought listeners to the edge of their seats. The great discovery at this year's contest comes in the form of a diminutive phenomenon: Ayana Tsuji. Richard Lin’s rendition of the Korngold Concerto was the special treat accorded to the audience at the end of an exemplary contest. Clad like a Hollywood lad, the master of silvery tone production introduced a cadre of characters in his convincing performance. Moving the score onwards and upwards to a level where Mahler meets Mickey, Lin deserves a top prize. Wizard of Oz references in the third movement did not escape this intelligent musician and his second movement showed sensitivity to Korngold’s ethereal orchestration. Thanks to the wonders of streaming, the last two finalists will continue to enchant and motivate. (Performances can be viewed on the competition's website: Click here to listen to the latest performances and click here to view archived performances. Competitions are not for racehorses as the frequently cited adage pronounces: torchbearers Tsuji ,Lin and Marquise Gilmore have shown that a superlative event is like a window that opens onto a world of great art. The audience roared its approval for four favorites: Dogadin, Marquise Gilmore, Tsuji and Lin. 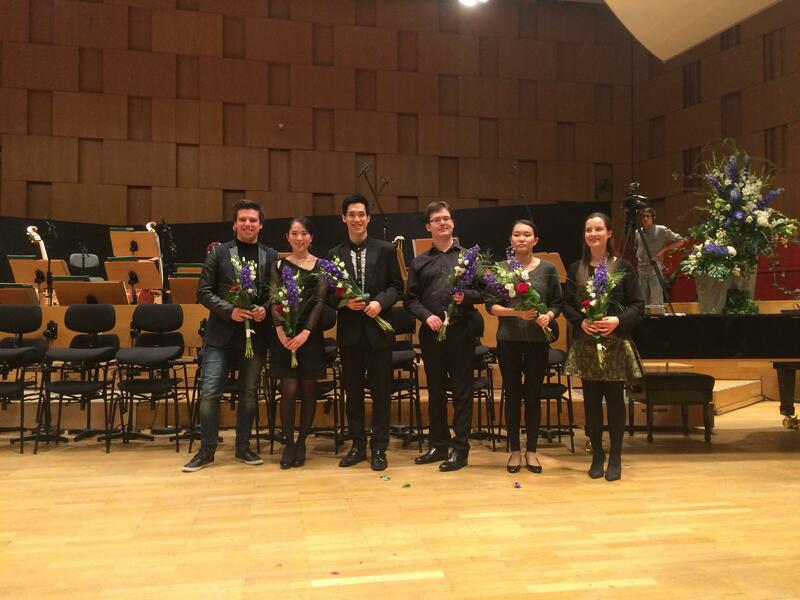 The jury awarded the top prize to Dogadin, third prize to Lin and a surprising 4th and 5th prize respectively to Marquise Gilmore and the most astonishing talent, Tsuji. Tomorrow night’s closing will bring word concerning the Special and Audience Prizes while as midnight melts into the wee hours many are still puzzling the second prize awarded to a temperate rather than temperamental player. Is it possible for a group of individuals chosen because of their expertise to adjudicate fairly? How do individual members of a jury listen? Privileged to have served on the Special Jury at the 9th Joseph Joachim International Violin Competition, these questions have been posed numerous times and deserve both careful analysis and full disclosure. A special jury, the Critics Jury was a feature at two prior sessions of the Joachim contest (2009; 2012). Music critics representing a variety of media cast a separate, independent vote based on reactions to the semifinal and final performance rounds. Aside from the traditional admonitions to adhere to ethical behavior and a ban on early disclosure (no results were permitted to ‘leak’ to the press) the critics were free to decide according to their own rules. The 2009 Critics Jury was well nigh unanimous (one dissenting vote) in their choice of Tobias Feldman as winner, diverging from the mainstream jury’s choices. In 2012, both juries chose the same winner without reverting to any form of consultation: Fumiaki Miura. This blogger remembers relaxed discussions on music, the ins and outs of competition life and the pros and cons of the competitive arena. German colleagues steeped in classical philosophy and Frankfurt School analysis brought a different form of consideration to the table. My guiding light queries: “does it speak? Would I want to attend a recital given by player x or y?” inspired initial skepticism before my worthy colleagues found a modicum of validity in my non-philosophical view. The 2015 Special Jury was given the task to compare then twelve performances of David Robert Coleman’s "Cut up" in the semifinals and come to a consensus as to who was most deserving of the 3000 Euro prize. Stay tuned to this website for the info tomorrow! Armed with copies of the score, four critics and the composer found their own ways to consensus. Without any form of prior consultation, two and only two candidates piqued our interest. The first criteria, the all-important ‘take the score seriously and play what is actually there’ was paramount. The first night of the final round was opened by Amalia Hall’s chance to shine in the Sibelius Violin Concerto. Perhaps ill at ease with a less than acceptable instrument, Hall tried her best to project over the substantial orchestral sound produced by the NDR orchestra. Unfortunately she often fell into the habit of vibrating on every other note instead of carrying the sound. Her interpretation never rose above the ‘better safe than sorry’ school of playing: secure, neat and tidy but alas, no poetry, fire or storytelling to grace Sibelius’ 150th birth year. Sergei Dogadin. Photo by Benjamin Bonouvrier. Benjamin Marquise Gilmore is simply incapable of playing an ugly note, a false accent or misplaced Blessed with the ability to spin long lines of almost unbearable sweetness, his Beethoven graced the hall with a sinuous elasticity that brought back memories of great performances by Frank Peter Zimmerman. His cadenzas were questionably original in the context of a competition where the jury might be ruffled by too much change. Two performances worth waiting for: the world is not only watching but listening with the greatest admiration. If you wish to hear performances from the Joachim Competition: Click here to listen to the livestream and click here to view archived performances. The last day of semifinal recitals at the 9th edition of the Joachim International Violin Competition Hannover showed great deference to Prokofiev: the first sonata was chosen by a pair of candidates and the second sonata closed the recital rounds. Shion Minami (Japan) seemed to operate in a world separated from both the enchanting pianism of Thomas Hoppe and Ravel’s rich metaphorical musical kingdom in her interpretation of the a gem of the 20th century literature, the Ravel Sonata. 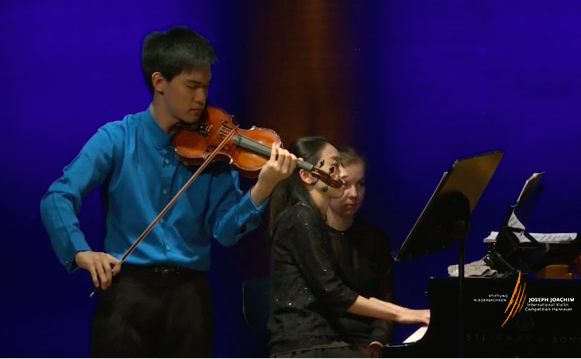 As expected from a semifinalist at a major competition, the young violinist possesses a well-groomed technician capable to project exceptional fast passage. However, the connection between impressive execution and communicated musical intention has a long way to go: Ravel’s blues lacked swing. The high point of her presentation was the atavistic second movement of Prokofiev’s f minor sonata, which crackled with fiery determination. The slow movement suffered from a lack of vibrato warmth and a reliance on portato to replace true legato playing. Although one of the youngest amongst the semifinalists, the Japanese violinist Ayana Tsuji is blessed with a pronounced musical personality and a vibrant stage-filling presence. Performing from memory, the Stravinsky Duo Concertante was a perfect vehicle to communicate her outstanding command of both score and instrument. One of a handful of contestants who was at one with the piano score, one can only hope that her partnership with Thomas Hoppe will continue to delight audiences worldwide. Tsuji was able to move us away from a contest by opening the door to a wide and wonderful musical world. Cut up moved from a compulsory work subtitled ‘study’ to a worthy concert piece at the hands of a musical master who memorized the demanding score as well. Hoppe and Tsuji in Prokofiev’s f minor rivaled legendary performances from bygone days in their ability to change character, spin endless lines of dramatic text within the context of the composer’s intention. Welcome to the major league of great artists! Anna Malesza (Poland) started her program with an extroverted take on Cut up before proceeding to Grieg’s Third Sonata (c minor) op. 45. An artist with a commanding presence, Malesza has a tendency to overplay in the heat of the moment, perhaps effective in concert audience but questionable when under jury scrutiny. Grieg was all Sturm und Drang with too many lapses in terms of intonation and phrase endings. Sarasate’s Carmen Fantasy was delivered with enormous passion but once again, intonation lapses took their toll. The honor of closing the semifinal recital round was accorded to the Taiwanese-American violinist, Richard Lin. A musician of great charm with an expansive sense of style, his Prokofiev d major presented was delivered with panache. Back in the 20th century, a famed US advertisement proclaimed, ‘you don't have to be Jewish to love Levy’s’ and you certainly don't have to be Jewish to deliver Heifetz’ beloved encore, Achron’s Hebrew Melody with just the right amount of schmalz. Cut up was given an intelligent reading and Wieniawski’s Polonaise Brilliant on Faust was projected with a Technicolor palette of sound and shimmering acrobatics. 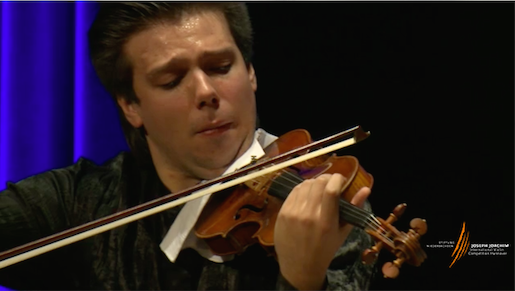 On the second day of semi-final performances at the Joseph Joachim International Violin Competition Hannover, Sergei Dogadin (Russia) brought the compulsory piece, "Cut Up" to the fore as a prelude to his chosen recital program. A muscular player with a penchant for dramatic gesture, Dogadin added a touch of sweetness to the first movement of Stravinsky’s Divertimento. The composition afforded him with an excellent choice to show off his wonderful bow control and partiality towards the jagged, jazzy rhythms that lie so close to the surface in Stravinsky’s score. With such a sumptuous bow arm one would have expected more feeling for tonal beauty. As if wishes were meant to come true, Dogadin dared to deliver a pianissimo opening enhanced by fast, shimmering vibrato in a tersely effective rendition of Tchaikovsky’s Meditation. Paganini’s Nel cor non piu mi sento out earned high marks for perfect execution but less kudos in terms of imagination. If bloggers predictions are worth the weight of the paper they are written on, Sergei Dogadin will lead a major orchestra in the not-too-distant future. The American Nancy Zhou opted for a sizeable program, perhaps overly varied for a competitive setting. Her take on Schubert’s Grand Duo (with repeats) suffered from a lack of imagination in terms of color: all phrases were created equal in the first movement with the same amount of bow, vibrato and all-too-often bow speed. Zhou gave the most convincing performance of Cut up to date and delivered a top-notch Waxman Carmen Fantasy. Reputedly a young woman of multiple talents who combines scientific studies with violin performance, Zhou is a young artist at a crossroads. With so much technique at her disposal, she should be tempted to delve further into the richness of the repertoire she plays so wonderfully. The artistic top-of-the bill, the UK trained, Dutch-US national, Benjamin Marquise Gilmore opted for an intellectually satisfying program framed by two sonatas: Schumann’s probing a minor Sonata and the richly scored Janacek, Sonata. As his choice of program readily evidenced, Gilmore is a thinking-person’s musician: a true artist of consummate good taste and intensity. Hats off to the Joachim Competition for giving a wide berth to a variegated repertoire in the recital round. His Schumann provided the listener with a delightful respite from the usual technical focus that dominates the competitive world. Gilmore gave a performance of a lifetime as he took the listener through a kaleidoscope of emotions, moods and sound colors in his sonata explorations. Supported to the maximum by the thoughtful Natsumi Ohno, Janacek’s consonant -rich vernacular permeated the hall. In a nightmarish moment, his Wieniawski’s Polonaise in A major was sadly interrupted by a memory slip. A chorus of bravos rewarded the most interesting musician amongst a strong field of contestants as he repeated the Wieniawski with renewed vigor and charm. Hopefully the jury will muster the courage to grant this unusually fine musician a place in the final round. The contrast between Gilmore and the second day’s last candidate, the diminutive Ririko Takagi (Japan) could not have been more pronounced. One of the youngest (19) performers at this year’s contest, one may wonder why her mentors did not encourage her to wait for a few years before taking on the challenges of a major competition. Her Saint-Saens d minor Sonata op. 75 showed evidence of impeccable schooling but little sense of personal input or musical communion with the remarkable pianist, Rohan da Silva. A penchant for portato cut long phrases into short segments while the closing moto perpetuo raced by at top speed. Speed alone doth not music make, to continue the blogger’s Shakespeare allusions. A young performer with the ability to toss off Ravel’s Tzigane deserves heaps of praise. Let’s hope Takagi grows as a musician, time is on her side. To the uninitiated, Hannover, Germany’s Saxon trade fair capital might seem to be an unlikely location for a major violin competition. A short trip down memory lane instructs that no less a light than Joseph Joachim, founding father of the Berlin Conservatory and a fervent champion of all things Brahms, spent his formative musical years as concertmaster of George V’s Hannover orchestra. Joachim’s diplomatic skills changed the face of accepted repertoire: he insisted on showcasing Wagner, a leap of faith for the Jewish-born Joachim and patiently taught the benevolent monarch the ins and outs of listening to ‘modern’ music. The Joseph Joachim International Violin Competition, under way right now through Oct. 10, pays much more than lip service to its illustrious forefather: its commitment to musical development echoes Joachim’s emphasis on education and his devotion to building a musical tradition where a solid technique is the foundation upon which creativity and artistic freedom rests. 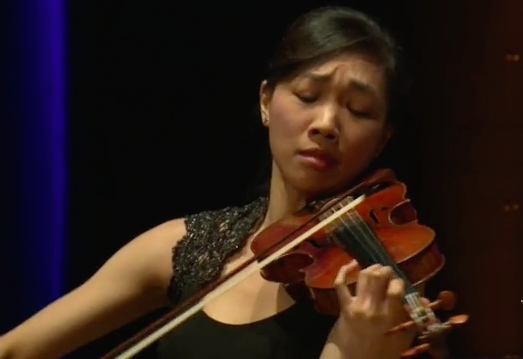 The semifinals at the 9th Joseph Joachim International Violin Competition started off with a level-setting recital program given by the diminutive Christine Lim (US/Korea). Looks as we have all learned can be deceiving. (If you wish to hear these performance, click here to listen to the livestream and click here to view archived performances.) A powerful player with an impressively loaded toolbox of violinistic skills, Lim’s performances were remarkably even. Like many a young competitor, she erred on the side of caution: instead of opening her program within her musical comfort zone, Stravinsky’s Suite Italienne or Kreisler’s La Gitana, she started with Brahms G major Sonata, op. 78. Although the imaginative Thomas Hoppe did all he could to gird her on to greater flights of fancy, her rendition was conservative both in terms of palette and interpretation. Coming into her own in the Stravinsky, Lim showed a deep affinity to the Baroque idiom and Stravinsky’s wit. To experience the piano artistry of the Sri Lankan-born Rohan da Silva as he encouraged the second candidate, Russian violinist Marina Graumann to come to the fore reminded the audience of the universality of music even as projected in the competitive arena. It goes without saying that contemporary contests showcase numerous nationalities and diverse schools of technique and interpretation. To witness this diversity in its highest musical form is a delight unto itself. Graumann took the plunge by opening her program with Ravel’s Tzigane a risky choice in the competitive sphere. After all, the pianist literally sits and waits as the violin soloist spins tales of gypsy lore putting the pressure squarely on the violinist’s shoulders. For a competitor whose temperament was larger than her ability to control both nerves and sound production, this challenge was decisive. The Joachim competition chooses not to list the instruments played by semifinalists: after all, the proof of a meritorious performance lies in the playing not in the instrument’s pedigree. However, the third recitalist, Amalia Hall (New Zealand) was clearly at a disadvantage with an instrument that balked rather than blessed. Like the two violinists who preceded her, she also took too much of a risk in terms of recital order. To paraphrase Shakespeare, ‘a competition is a competition’ and calls for astuteness in terms of programming and program order. For the first three semifinalists, the best of their renditions were not presented at the outset. Hall’s Prokofiev Sonata no. 1 in f minor lacked true grit and staying power. The stark first movement demands pathos and managed musical aggression that lay far beyond Hall’s power. 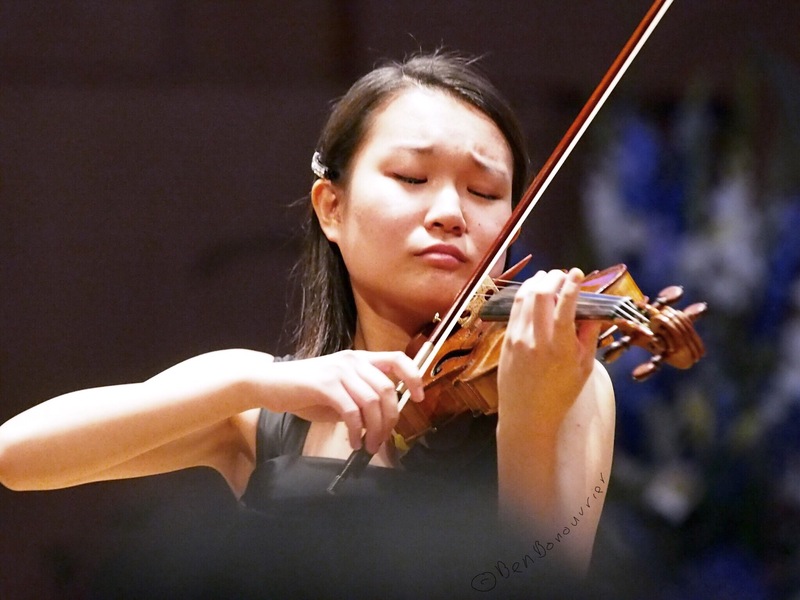 Her ability to spin a breathtaking line as evidenced by the initial phrases in Schubert’s Grand Duo would have given the audience a much worthier introduction to this young artist’s gifts. Hall’s Wieniawski Polonaise showed panache and drive; indeed, a pity that memories of Prokofiev lingered. Last but certainly not least, the Ukrainian violinist Diana Tishchenko brought the house down with an artfully constructed program that opened with Bartok’s Solo Sonata Sz 117. The great Gyorgy Sebok opined, ‘What is night music? Bartok’s night music does not refer to a person who sings in the night, it is that magical moment when the night sings to you.” Tishchenko was not only artful in her riveting command of Bartok’s fiendish score; she brought night in all its mystery to a rapt concert hall. Sharing the stage with fiance and fine pianist Joachim Carr, Tishchenko wove a fantasy of changing colors through her mature interpretation of Brahms' d minor Sonata op. 108. The compulsory composition, Cut-up by the Berlin-based British composer David Robert Coleman was treated to no less than four world premieres in one day! 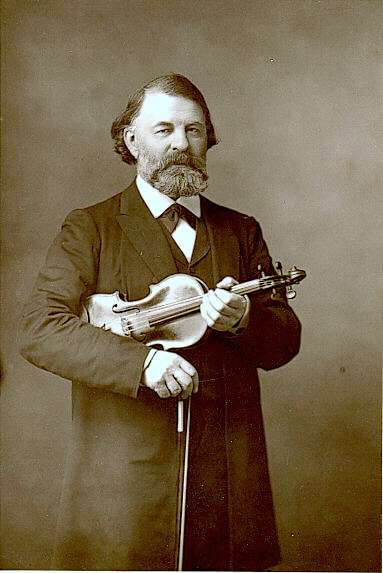 A composer of great aptitude and modesty, Coleman writes, “I wish to claim the violinist for my composition like an actor, who has already studied many roles and is interested in taking his art to the next level.” One of the joys of contests that cultivate contemporary pieces is the chance to experience so many successive interpretations. Whereas Hall seemed to flounder in her understanding of the score, both Graumann and Tishchenko reveled in their discoveries of a new vernacular. 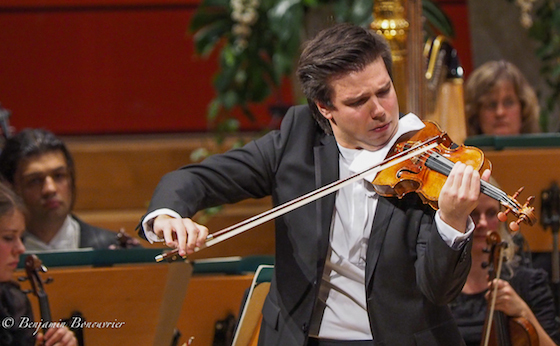 To cap off the Hannover musical marathon day 1, the public was invited to an evening program featuring the 2003 First Prize Winner, Nemanja Radulovic as soloist in Samuel Barber’s violin concerto. The Deutsche Grammophon artist whose album, Journey East, boasts a heady mix of Balkan and classical offerings, brings back memories of the British progressive rockers who formed the band Jethro Tull in the late 1960s. Radulovic’s ripped clothes, onstage swagger, head banging and wide repertoire of grimaces could detract from his fiery musicianship, yet the artist does command the stage and his chosen repertoire. Unfortunately, conductor Karen Kemensek could not keep the Lower Saxony State Orchestra from blasting the Barber score at ear-splitting volume. As Radulovic was running around the stage, the orchestra took its chance to cover his playing. 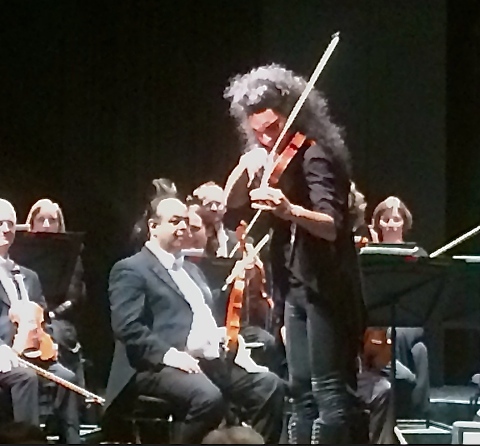 Fortunately, the audience darling was able to show his prodigious technical prowess in an encore that took high speed Paganini to the Balkans on a raucous, thrilling ride. Who knows what the future will hold for the 2015 competition winner?